It's about time I did a proper show and tell of my Blooming Doilies quilt. I'll probably waffle on a bit because I want to jot down all the details so I don't forget them but you can always just scroll through and look at the photos if you find my ramblings too wordy. It all began when the NSW Quilters Guild announced they were having a red and white exhibit for their 2015 show. Of course I was going to join in. 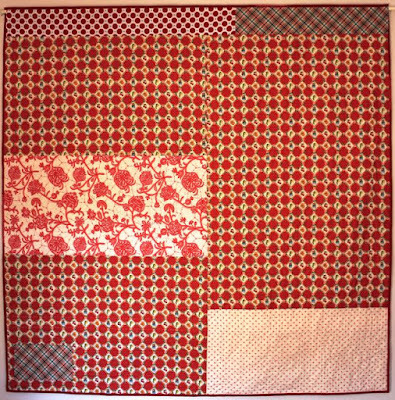 The catch was how to do a red and white quilt in a Rachaeldaisy style. I gave myself the challenge to find a reason to use red or white rather than replicate a quilt pattern in red and white. 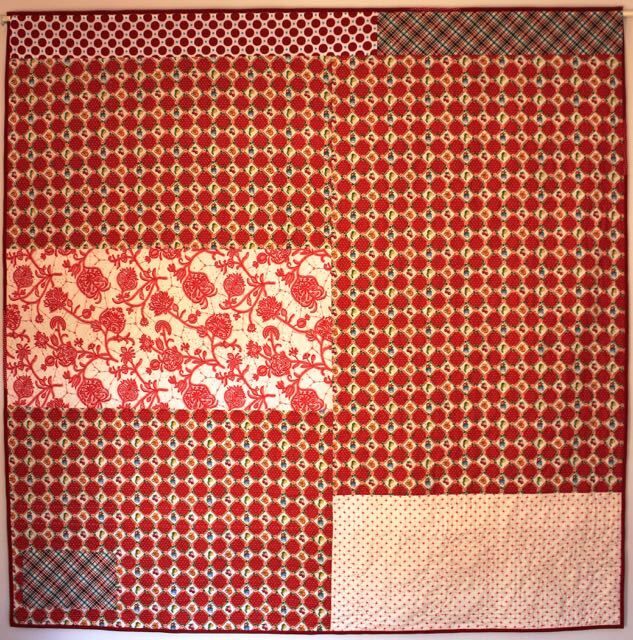 For the record I love red and white versions of quilts, I just wanted to approach the challenge in a different way. I had quite a few of the doilies already but found more as the quilt came together. It's hard to tell from the photos but the leaves are wool felt. I tried cotton but they looked too flat in comparison to the doilies and yoyos. I also like the way the felt adds another texture. As you know I love yoyos and they fit in perfectly as flowers. I was asked if I used a yoyo maker? For some sizes I did, and others I just cut circles and sewed them into yoyos. I enjoyed adding buttons, purposely using different sizes to add interest. 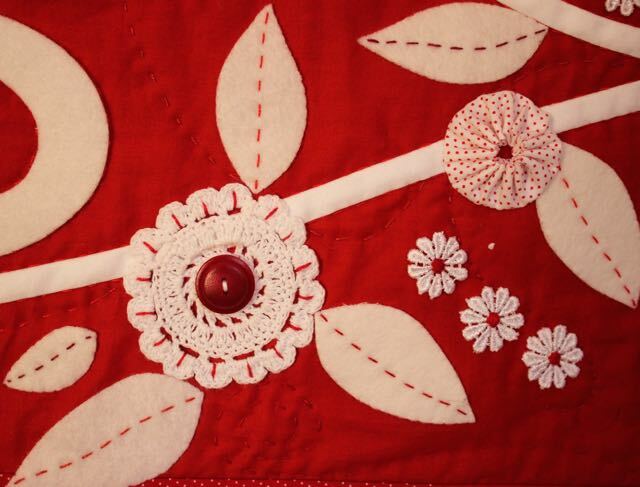 The centers of the tiny daisies have been sewn with different shades of red. It's not the sort of thing you might notice but once again I like having those small variations for anyone who takes a close look at my quilts. Some of the doilies I chose to embellish with a circle of fabric, buttons or yoyos. Others I added to the centers of dresden plates. 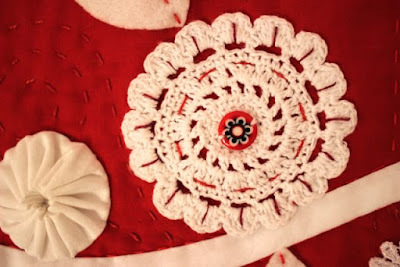 Some were simply appliqued to let the white on red contrast create the pattern. My initial plan had big heart doilies for the corner blocks, but then I changed my mind when Mr Daisy showed me a youtube video of artic hares hopping around on the ice. Inspired I set out to draw hares. They look more like rabbits but I don't mind, they're all cute. carrying sweet messages of love because red and white reminds me of Valentine's and love, or in playing cards, the hearts suit. 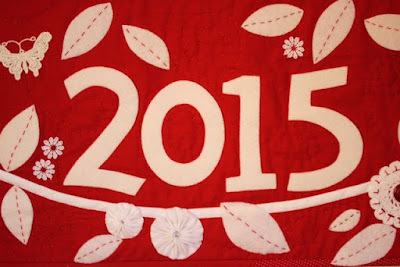 I added the year to mark the year of the Red and White quilt challenge. This is also recorded on the special label the guild sent out to participants to use. My favourite kind of backing, pieced and scrappy. The quilting was done in different shades of pearl 8 thread in big stitches. The center panel as different sized bubbles, the borders as swirls hopefully giving an impression of curling tendrils or butterfly paths. I found a way to sneak a blue daisy in. 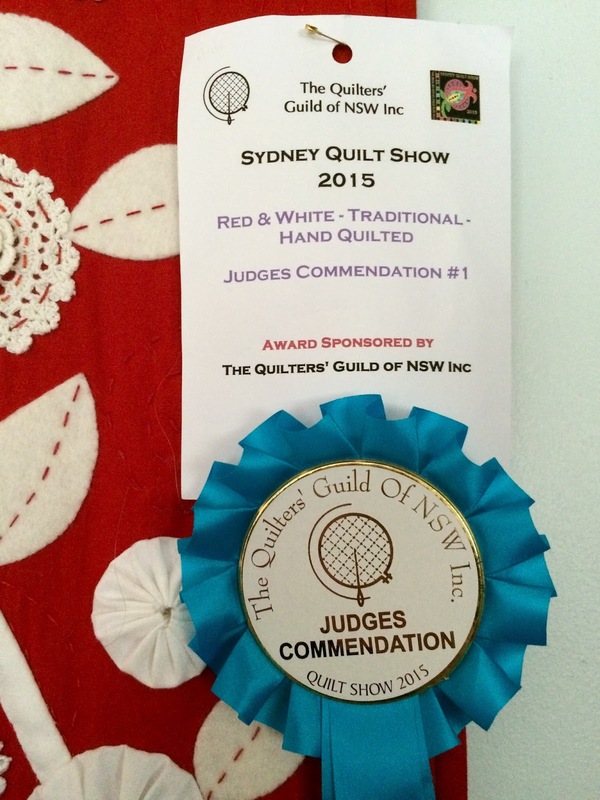 Blooming Doilies received a ribbon for Judges Commendation in the Red and White Traditional Hand Quilted category. I was especially honoured because of the high standard and variety of the quilts in the red and white exhibition. One last story - while at the quilt show I saw a man studying the quilt so I said hello. He spoke to me of childhood memories of his mother, aunts and their friends making lace doilies. How wonderful that a quilt I made can bring up memories of yesteryear for another person. Quilts can be quite magical at times. PS. 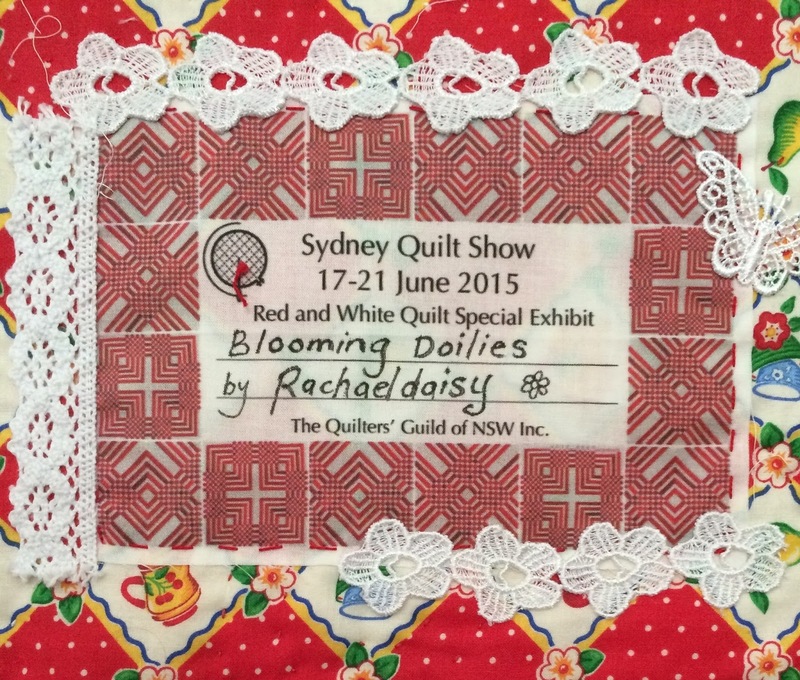 A super special big thank you to Quiltmania for including Blooming Doilies in their Sydney Show article. 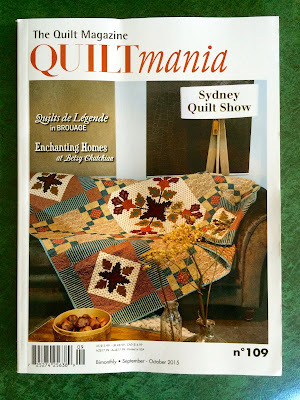 They totally rock for showcasing Aussie quilters to the world!!! This quilt is so beautiful! 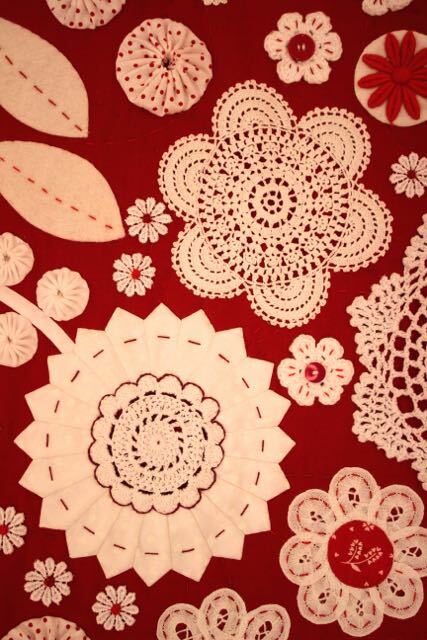 I love all the doilies and all the wonderful details you included in the quilt. It is a joyous quilt! And I love that you shared so much about how you made the quilt. A superb job, my friend! Congratulations! Congratulations! As always this is such beautiful creative work. The details are adorable and I love how much thought you put into each element! What an absolute delight this is Rachael!!! The thought and detail that has gone into this beautiful quilt is a credit to your creativity and talent! Sharing your story has also added so much to understanding and appreciating the quilt itself! (BTW there are some little lace daisies there that I'm sure I have in my own 'stash', passed down through my mother..... I would never think to use them in m quilting, although it has given me an idea for my next "Four-In-Art" quilt!) Congratulations...but only a commendation? I love it. Your quilt was a worthy winner of an award. Nice and cheerful, as always. Don't apologise for telling us all about it. That makes it all the more interesting. I love that Mr Daisy inspired a design element. Your quilt is simply stunning. A work of art. I wish I possessed just a hint of your creativity. Congratulations. Thanks for an up close look at your incredible quilt. It has some of my all time favorite elements, berries, flowers, lettering and whimsy! It is a winner in every way! Fantastic Rachael! Your quilt is just beautiful and I loved reading about how you chose all your little features. You're so darn clever -- I can't wait to see what you're working on now! A beautiful quilt. Love the red and white combo. 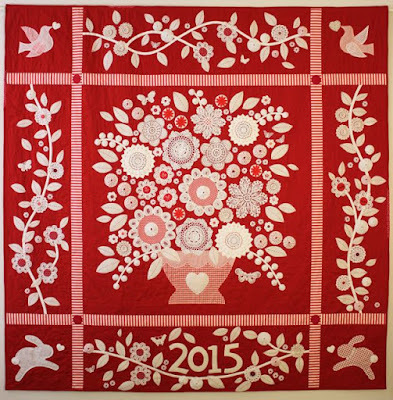 It is so much fun to read about your process through making of this quilt! Your posts are never too wordy.. I love the details you put into your thoughts and creations. Enjoyed every picture with details. Thank you for sharing! Beautiful and very, very creative. It is a masterpiece. Congratulations on the ribbon. You deserve it. Thanks for the close ups and the story of your amazing quilt! It's so wonderful and charming--I love it! Ooh, I'm so glad to see the details and to hear about the story of this quilt! Your innovation is always delightful. This quilt is one of my all-time favorites! What a great story to start my day. Thanks for sharing all the details about the doilies. Wow, lovely innovative twist in this red and white category. I love how you work girl. Great job, this is really a rachealdaisy heirloom now. Rafael, you forgot to mention its appearance in Quiltmania! Congratulations on all the well deserved recognition and kudos you are receiving on your quilts! You are such an original , creative quilter. Your blog is such eye candy for me. Love, love, love your style. Rachael, another beautiful and creative quilt you have made. I am in awe of your creative abilities. It won't replace my desktop wallpaper of the Clamshell quilt, but I love it just the same. Congrats on your ribbon. This quilt has so many of my favorites--big stitch quilting, yo yos, button embellishments, animals. I love how you put it all together and gave such attention to those little details. Such an incredible quilt Rachael! Loved reading through the details. Your quilt has so much character. Love it! This is fabulous - such a great way to use up those precious doilies that we inherit. Long may the memories last. Congratulations on your awayr - very much deserved. I always love hearing your stories. And all the close-up photos to enjoy the detail work that you do so well. 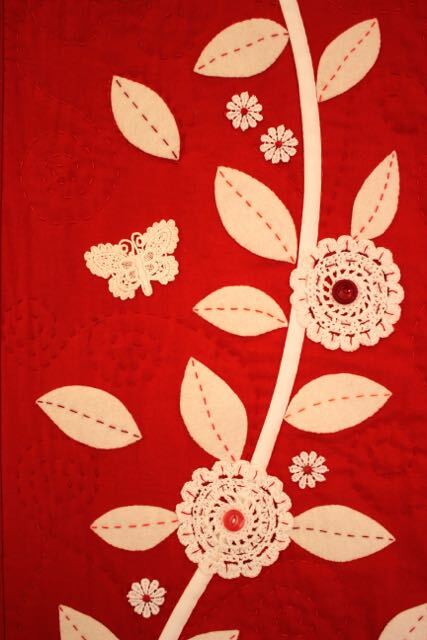 The quilt is a wonderful example of a modern innovative red and white quilt. Truly beautiful. I'm in heaven looking at the delightful detail in this quilt! Your work and creativity is sooo inspiring! As always I love reading about your process. Congratulations Rachael! 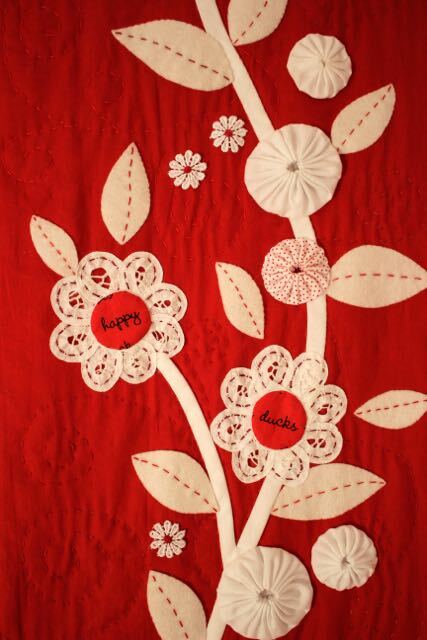 This beautiful quilt is such a Rachaeldaisy quilt! 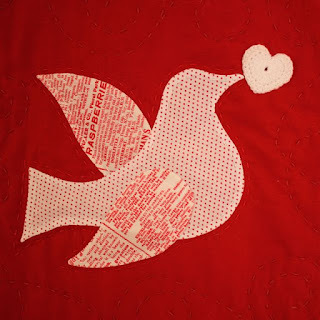 I remember seeing your quilt on the Template Free blog and thinking it was a lovely applique quilt with some very different elements added which gives it a quirky modern twist. Thanks for sharing your thoughts and processes involved in making your quilt. Congratulations! Your quilt is gorgeous. Love the colours! Congratulations! What a wonderful way to use up doilies. 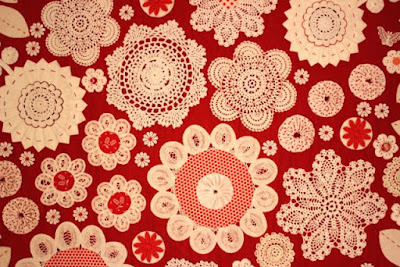 Up until now well doilies on quilts were in the "twee" category....up there with wearable appliqué cat sweaters.....I am sorry but we have all thought it, yes even you, the person reading this now! 😏 But now, no longer. You have done it again Miss Racheal and now my sewing room will have to make way for a doily collection in its midst. Well done on the challenge and your thought processes......now can we make appliqué cats even more attractive I wonder? Lol. Rachael! 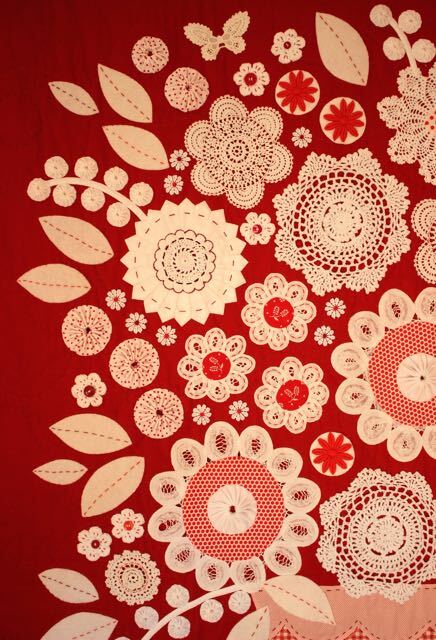 Blooming Doilies is fantastic! 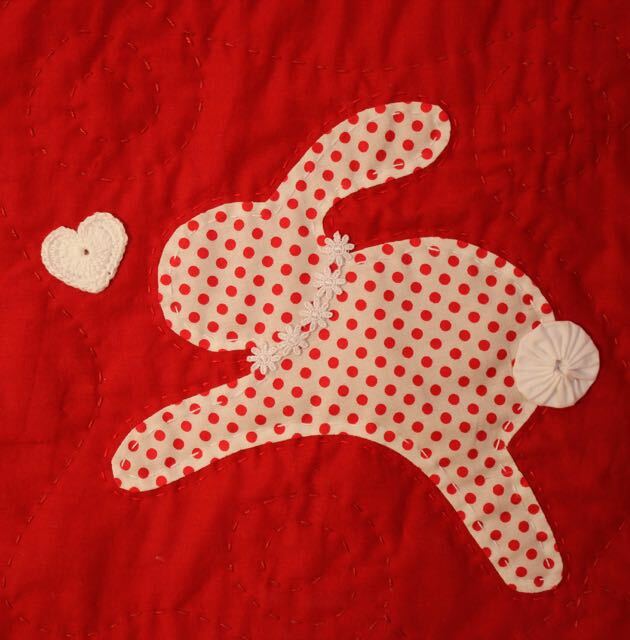 I love the details on the bunnies and the big-stitch work here and there. That's a well earned judge's ribbon! Your ramblings are as fun as your quilt. The details and the variety of handwork are wonderful. 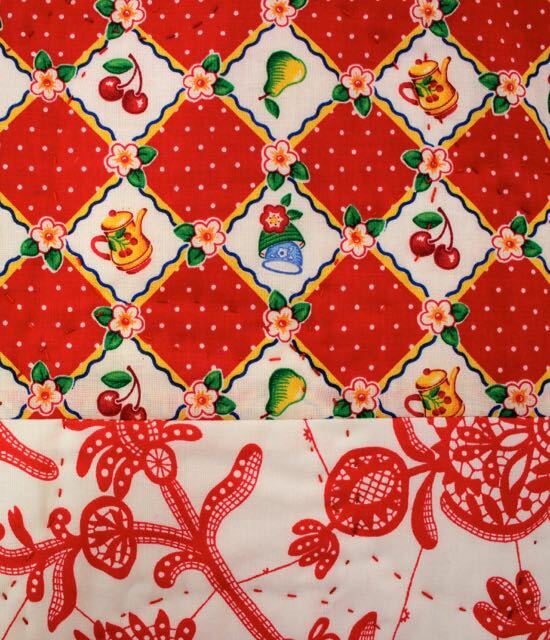 This quilt just oozes charm. Not surprising at all that the judges were impressed too! Simply wonderful! It's fun to hear from you about how a piece came into being - it's really interesting to see how your mind works!!!! 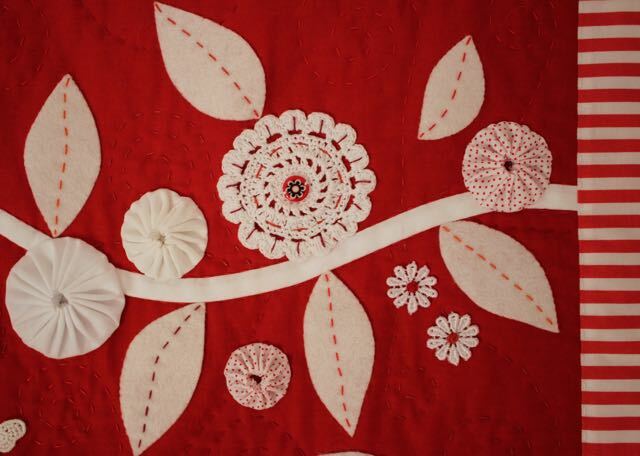 Just love the quilt, the doilies make it so special. Congratulations. 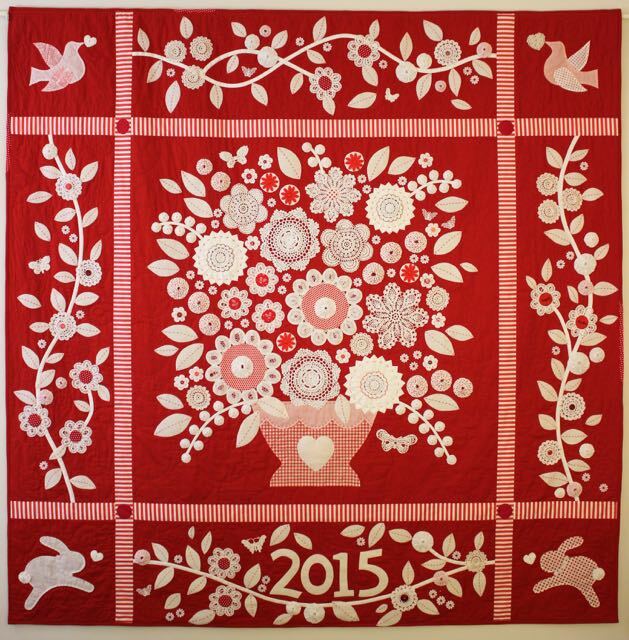 It is a stunning quilt Rachael - I loved seeing it in Sydney - congratulations again! An amazing quilt, such a great idea, beautifully executed. Thank you for explaining how the quilt was made and how you thought of the idea. So interesting. The label is fabulous too! Pleased it featured in the magazine, it deserved to. congratulations my friend! brilliant with all the textures. truly impressive and inspirational! love love love! Thanks for sharing your process. 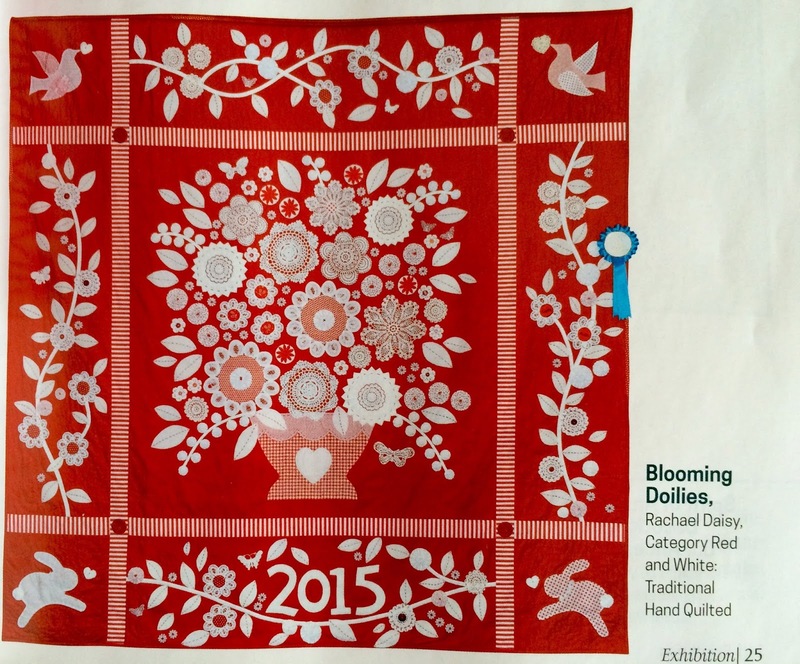 This is such a favorite quilt of mine and I was thrilled to see it in Quiltmania. Such a creative use of something most of us have hidden in drawers and cupboards! Its traditional. It's contemporary. It's beautifully made. And it is very, very YOU. I love the explanation of how you came to it -- so thoughtful. You are an irrepressible quilter! the backing has a lovely humble quality that is a perfect counterpart to the dash and exuberance of the front. Wonderful! Love, love, love this quilt, Rachael! The way the red peaks thru the doilies, all the different doilies, the felt leaves, the yo-yo's........love it all. And so pleased for you winning the prize AND being in Quiltmania - Yay!! Hearty Congratulations! 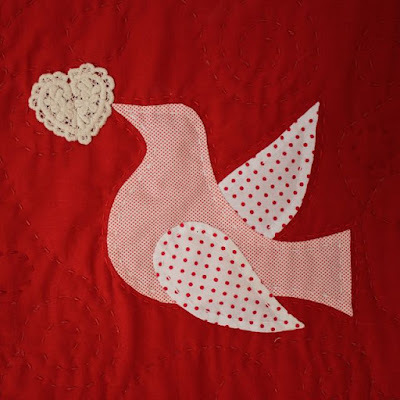 It is lovely to read about the process of designing and making your quilt. I love the way it grew with additions and changes to your original plans. And of course it is great to see it in the magazine. Oh Rachael, its such an amazing quilt.Congratulations on the award! It has made me wonder what you do with all your quilts, you can only have so many beds and so much wall space for them. I have a doily my grandfathers mum made. I would love to do something so show it off but I have been too scared of ruining it. You have given me some inspiration. Anything would be better than in sitting in a box. This quilt has a lot of wow factor! It has so much to see--the little animals, the button details, the hand stitching. I can totally see why it earned an award!!! Congratulations! I love reading your rambling...you should ramble a bit more! Il ne faut pas beaucoup pour rendre le monde plus aimable. Mais il faut du talent pour y arriver, ensuite, il faut du travail, beaucoup de travail, de l'imagination, de l'inventivité, encore du travail de l'habileté. Tuas tout cela et tes créations sont ravissantes. Tes palettes de couleurs rendent joyeux, ton sens de la composition est très au point. Oui, vraiment, j'aime beaucoup et je te félicite à nouveau. Really beautiful! And so striking in red and white. Did you stitch the doilies down just around the edges? I am always looking for unexpected ways to use doilies! I love them. Hello, hello! What a nice treat to come home to! 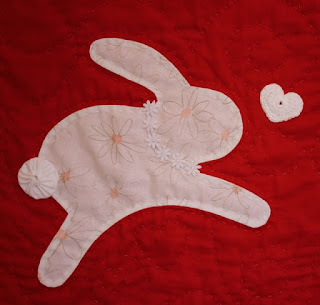 Great quilt, LOVE those bunnies. I have been in Germany for 20 days so have 570 emails to slog thru but looked out for yours and Rebecca's and Punkins Patch...great sheep 'farm'. Great job and what a creative mind you have. Another fascinating quilt Rachael, you really do create wonderfully unique pieces! Just a heads up (you may already know) that large photos of both Clamshell Carousel and Yoyos a la Mode are including in 2015 Modern Quilt Show article in Down Under Quilts magazine Issue 172 due out tomorrow! Beautiful quilt ~ I enjoyed reading how you came up with the design. 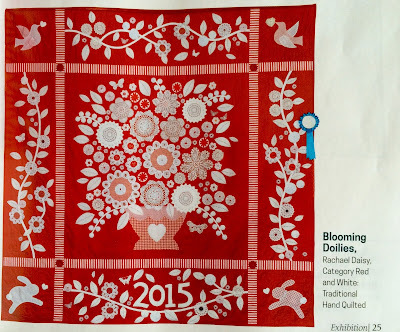 Congratulations on being included in the Quiltmania mag! I probably say it with all your quilts, lol, but this very well might be my favorite!!! I love red and white, but more than that, this is an awesome design - very well balanced, just the right amount of white, and the birds and hares are AWESOME. I could look at this all day and then some! so love this one - of course I say that about all of your quilts ! love the tiny bit of blue in that button, love those bunnies (well hares) and love that the florist in you comes out in the arrangement - its just so wonderful - love every detail - you are so clever ! Congratulations! You come up with such unique ideas, and those bunnies - oh so cute! Wow Rachael ! You out did even yourself with this beautiful piece of art ! It rates right up there with A Dollop of Cream ! I absolutely luv reading your blog and looking at your work! This quilt is no exception-amazing! it is just wonderful wonderful wonderful!!!!! !